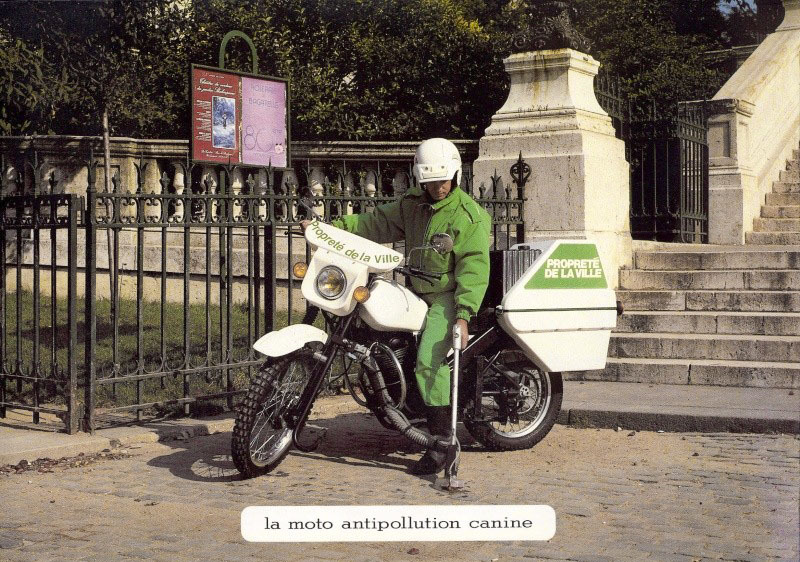 As you know, Team Wattwurm has always been ambivalent; we like electric cars and bikes just as much as we like loud and fast (and sometimes slightly obnoxious) modes of transportation relying on fossile fuels. 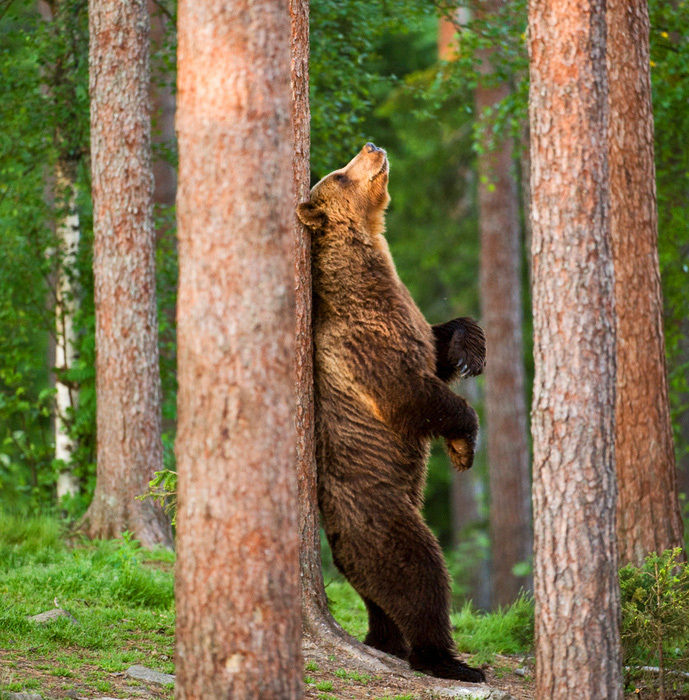 Yes, this might come as a shock to our new readers but sorry, we’re no tree huggers. 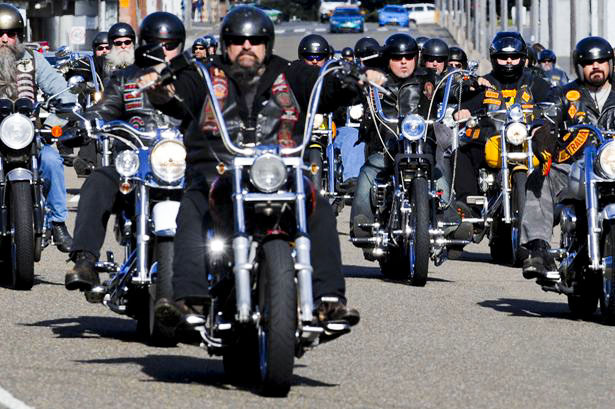 Now, while I have never been able to warm up to motorcycles, David has been an avid bike rider for years now. 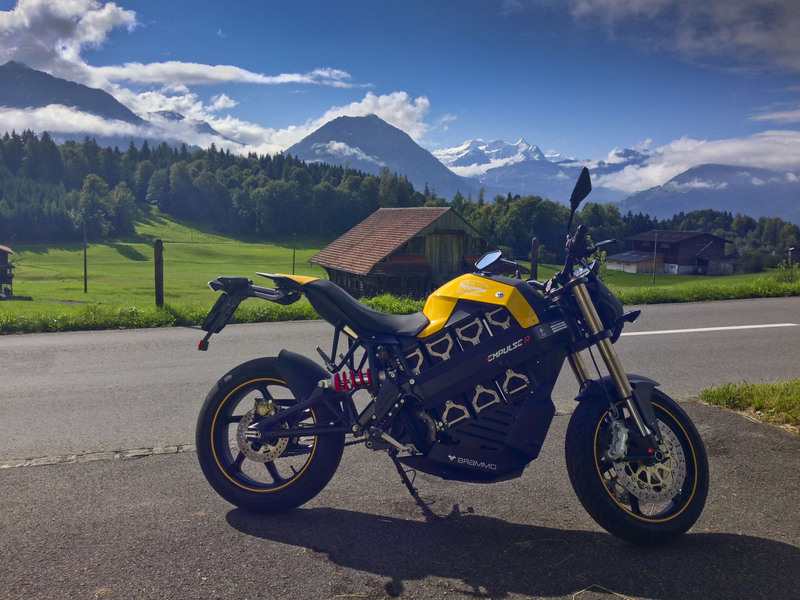 Some of you might be aware of the fact that electric motorcycles are slowly beginning to enter the market – even Harley Davidson has one in the making. 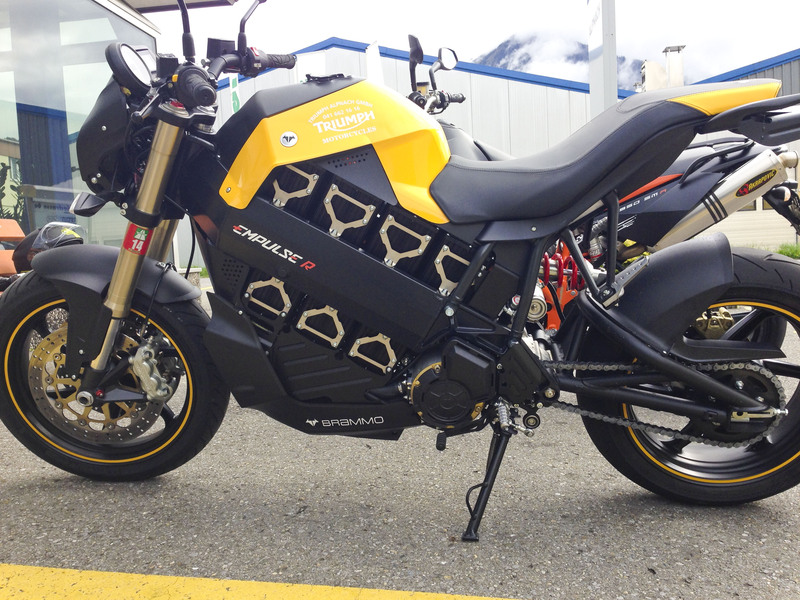 Therefore, David had been closely monitoring the latest developments for a while and soon picked up that the Brammo Empulse was ready to hit the european market. 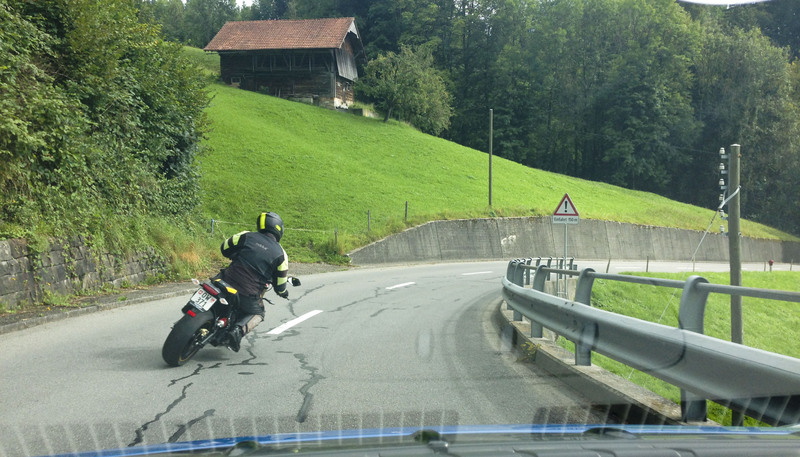 He quickly managed to trace down the first bike to enter Switzerland – and arranged for a test drive. That is why, on a quiet and foggy saturday morning, I set off in our camera car (i.e. 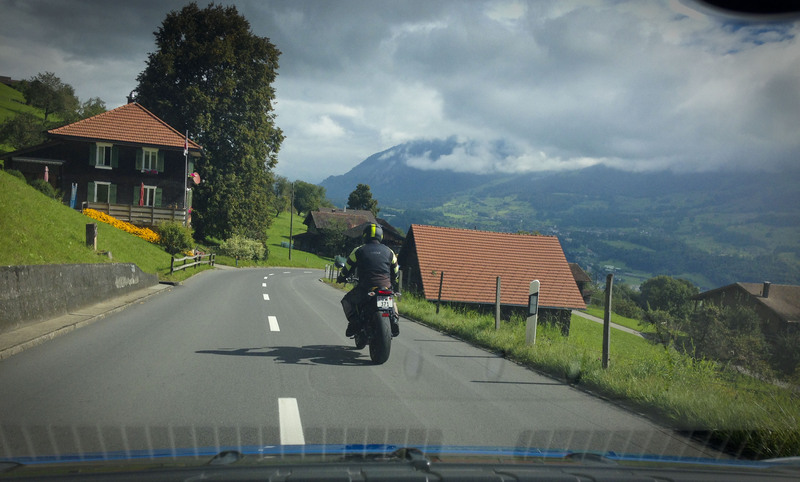 the Leaf) heading for Alpnach near Lucerne; David took a detour to clean his KTM since he wanted to have it evaluated as a possible trade-in. 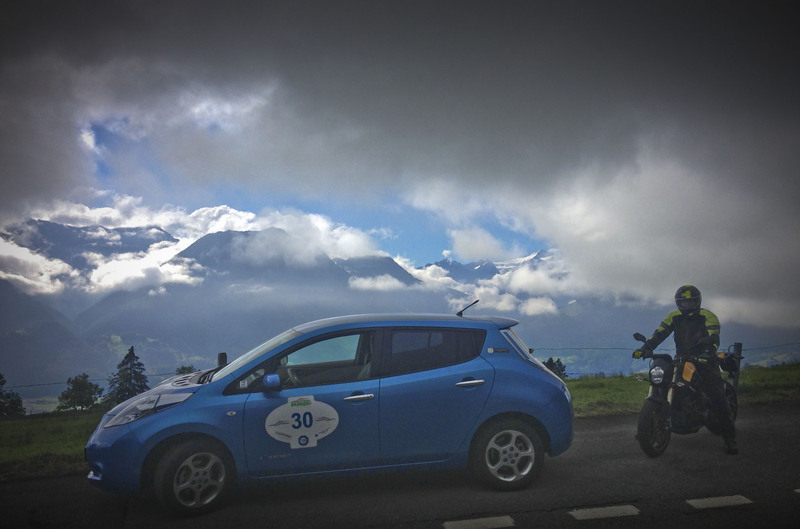 Total round trip distance was 136 km, right on the edge for the Leaf; battery charge had to be managed. Usually, this means reduce cruising speed and, whenever possible, drag. In practice, this of course means tailgaiting a truck. 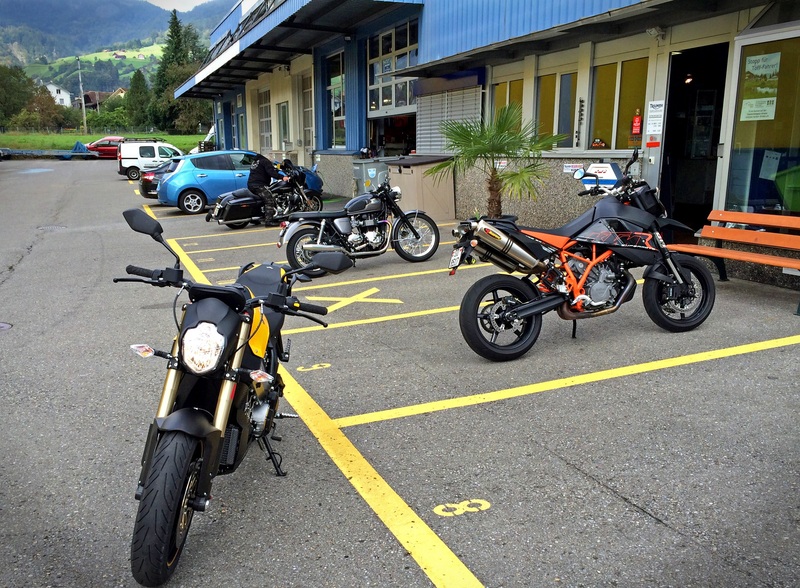 Even though it was planned that David would catch up at some point, I actually arrived first at our destination – the Triumph shop in Alpnach. By the time David had arrived, I already had found a power outlet to charge the Leaf as long as we’d be there. 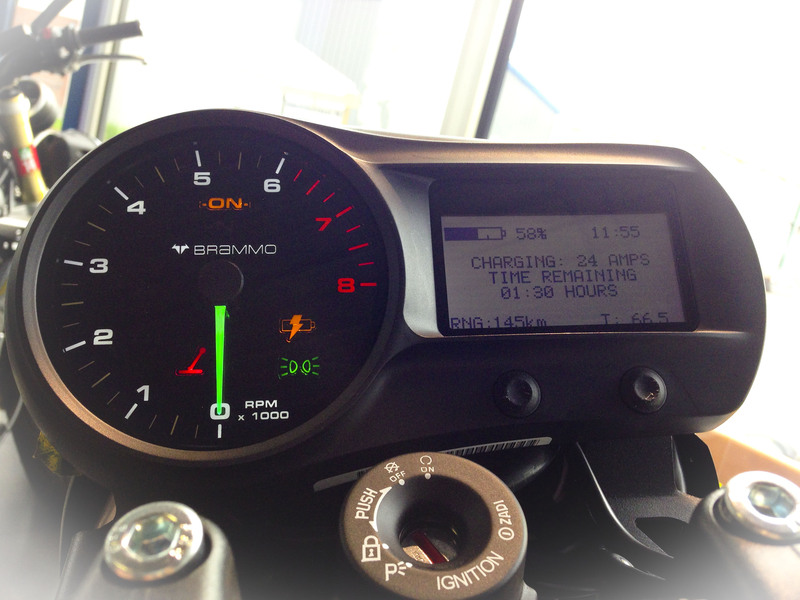 We found the Brammo waiting in the showroom, plugged in, charged and ready to go. We pulled it out and took a few basic parking lot shots to give you more of an idea. At first glance, it looks really nice. The design is contemporary, and those silver frames on the battery packs make it look unusual – we like it. 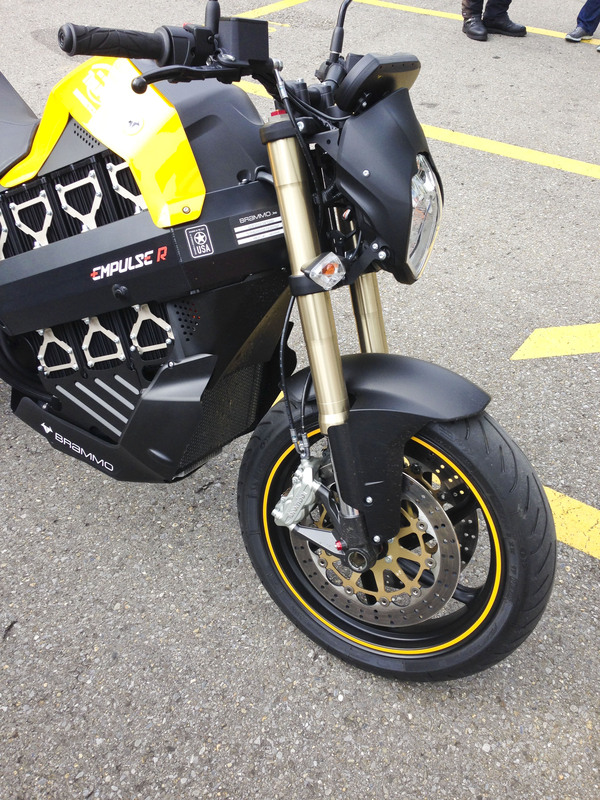 There’s not much to complain about, save for the rear wheel fixation which in our opinion is a proper eyesore. That really needs to be changed. After being briefed properly by Carmen on how to operate the bike, we set off. 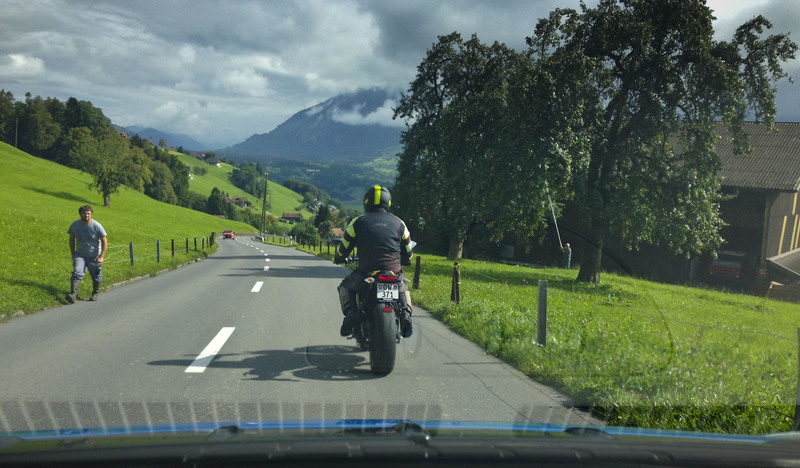 Immediately, David started his trademark slalom sverve which he does every time he sits in or on a new vehicle – as demonstrated below. From my perspective, the bike seemed to have decent power – but even I did notice that gear changing was time consuming, a thing David later complained about. 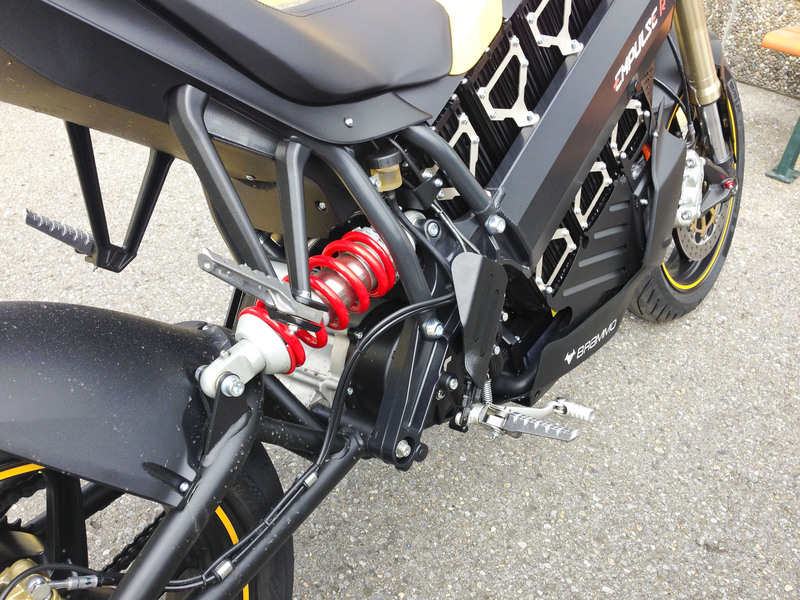 Even though the IET drivetrain supposedly was – at least partially – developed in collaboration with Brammo, it does not seem to fit the bike – more importantly, the gearbox is sticky and reluctant. Following David, I could literally tell that every gear change would take two to three seconds. 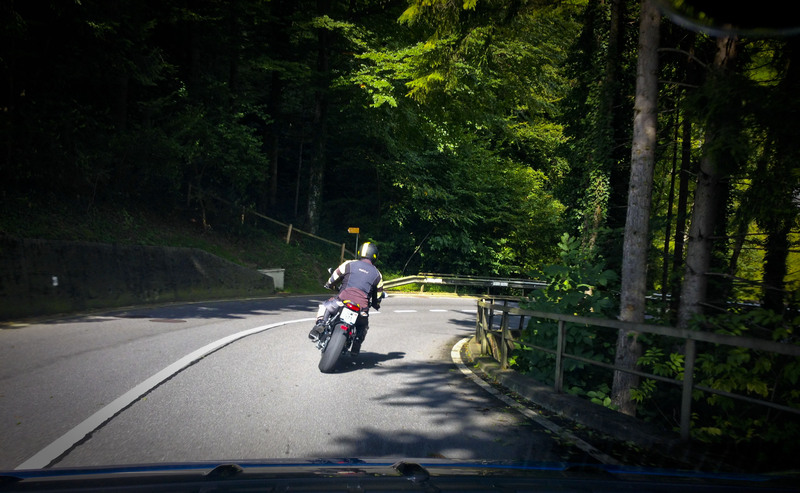 I did not have the opportunity to film it, but we did a similar experiment on our way home with David on his KTM 950 and believe me, I got dusted big time… No comparison to what you see above (even when taking into account that the KTM has much more power). So, considering the vastly different power to weight ratios between the Leaf and the Empulse, we dare say we’re not satisfied with its acceleration; we think that a two or three speed gearbox, designed specifically to fit the motor and drivetrain, would be an immense improvement. 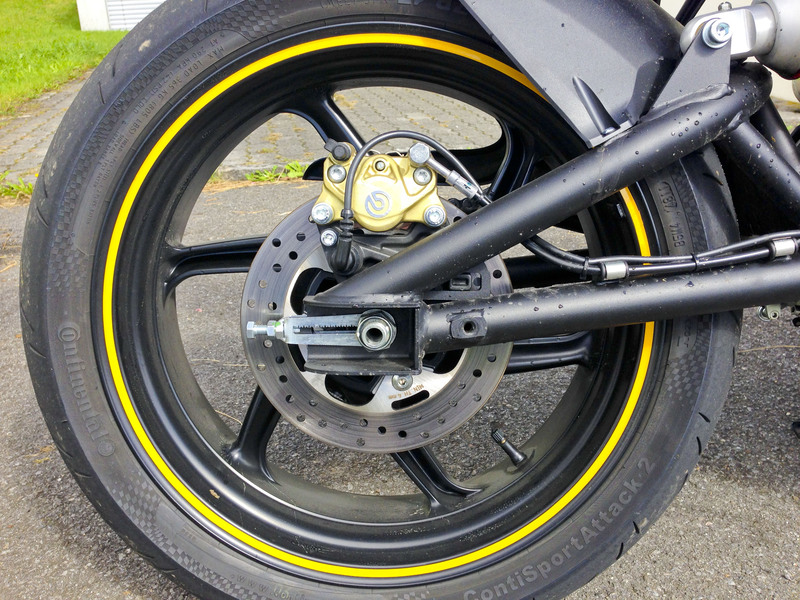 A quick fix would be to swap sprockets, because who needs a top speed of 177 kph anyway? 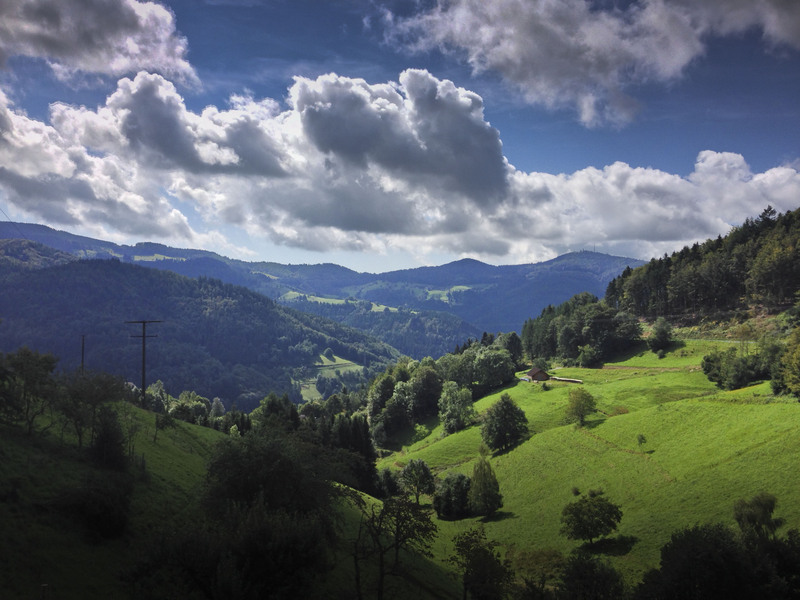 We had chosen the nearby Glaubenberg road to have both a proper scenery and some genuine fun. That said, we had agreed that David would stay within viewing distance to take more pictures, static and moving. That idea however got lost as soon as there were more than two corners lined up. I did my best to keep up but he was gone almost instantly. 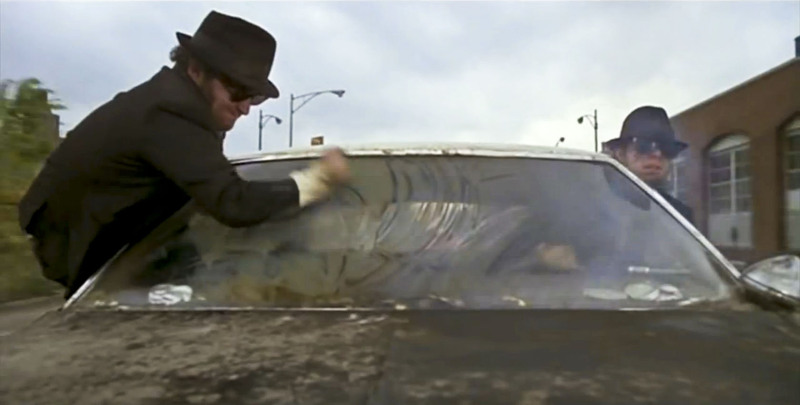 Using that as an excuse, I flung the Leaf up that road as hard as I could… Once again, the Wattwurm Effect set in. We decided to head back down (not that I had much of a choice anyway) and find a spot in the sun to shoot a few more pics. 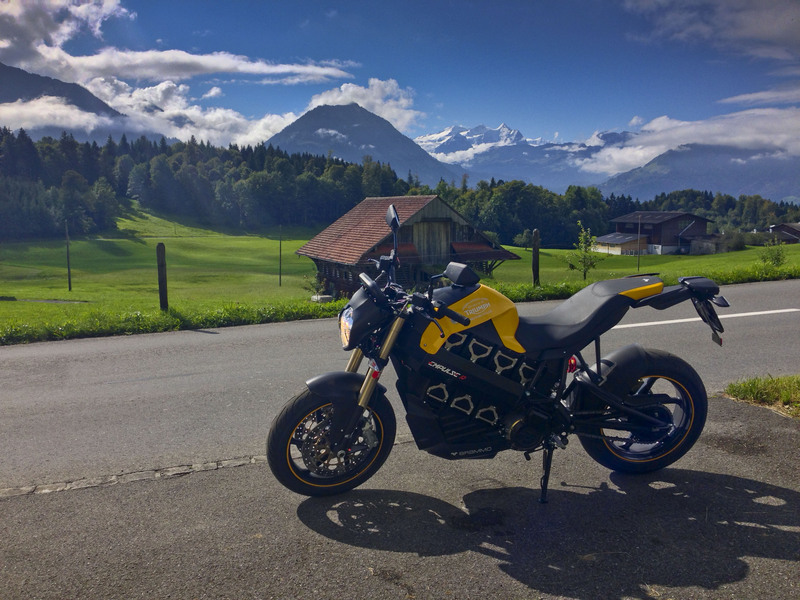 Eventually, we did make it out of the clouds again and found a nice and sunny spot to take another closer look at the Brammo. We mostly could confirm our first impression; it has the appearance of a proper bike, if a bit massive due to that battery setup; but there’s nothing wrong with that. 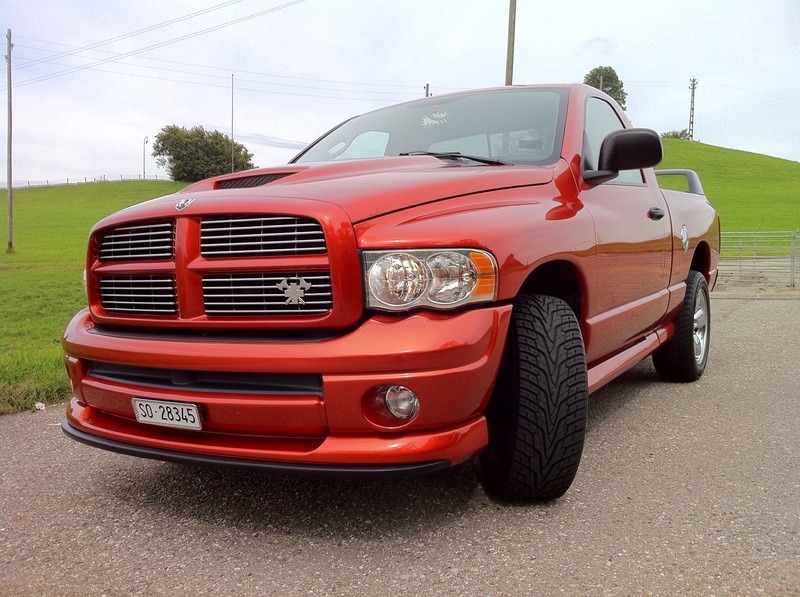 It’s good-looking and we think that particular color combination suits it well. in case you are wondering what it sounds like, here’s a drive-by, prominently featuring my index finger as supporting actor. David reported great handling and agility, with excellent brakes. Throttle response is precise, but the transition between acceleration, soaring and regenerating could use some fine tuning. The seat is well shaped and offers good support during acceleration. It would seem that David is slightly too tall for the bike, since you have to flex your knees quite a bit and that might be an issue if you have, well, knee issues. we continued our way down, enjoying the scenery. I really think we are priviledged to live in such a nice part of the world. but I digress… We shot tons of further pictures, which, sadly, basically all look the same (in case you hadn’t noticed yet). We did have an entertaining moment though when we managed to startle a friendly local, who, by the look on his face, was definitely kind of surprised to see an almost silent motorcycle fly by, followed by an almost silent car. We returned just in time to have another chat with Carmen, discussing driving and handling. Also, we don’t want to deprive you of the technical details. 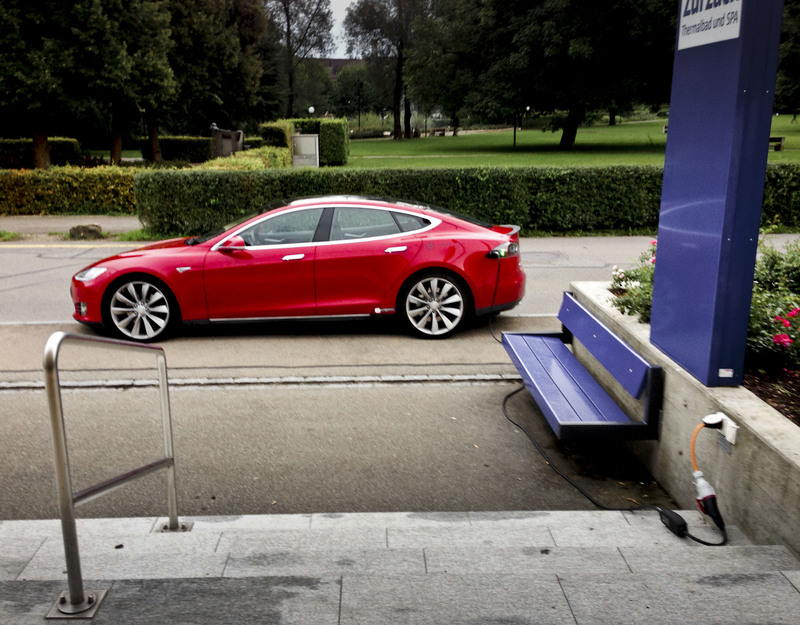 A full charge takes about three hours, with a resulting range of about 150km, realistically. 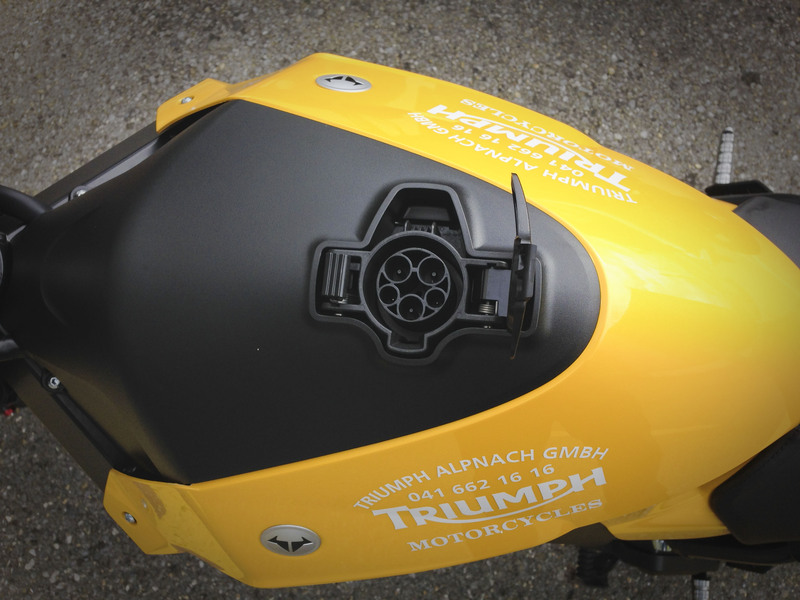 There is a Type 1 socket on top of what would be the fuel tank on an ICE bike, and the Brammo comes with a wall plug to Type 1 ICCB, more commonly known as a “charging brick” (here’s an example). 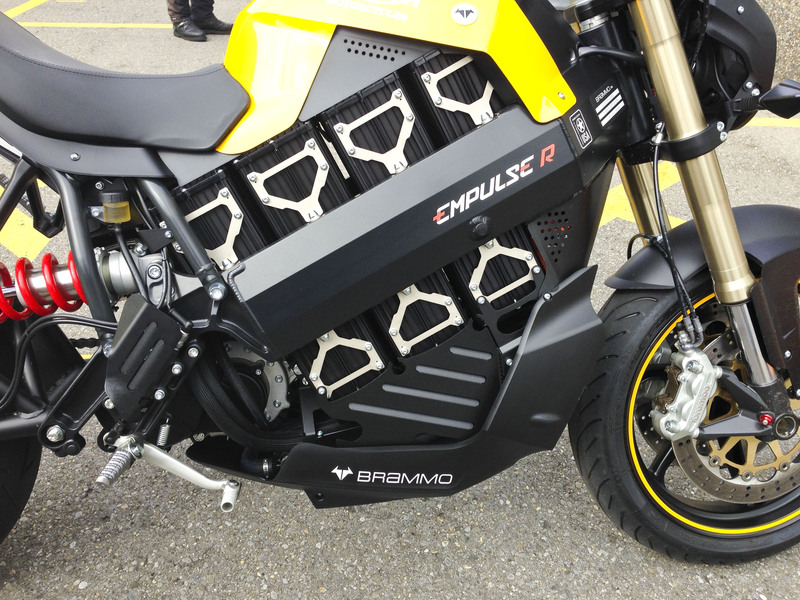 Now the Brammo was designed for the american market; there are over 7000 Type 1 charging stations available in the US – this means there’ll barely ever be any need for you to carry the ICCB along and you’ll most likely just use it to charge at home, so no argument here. However… Those of you who travel electrically will know that in Europe, we typically have Type 2, ChaDeMo and CSS plugs available on our chargers, but Type 1 is nowhere to be found. This means that you’ll have to carry your ICCB with you at all times – it’s the same for our Leaf. But in a car, you don’t really care, you just toss it in the trunk. On the bike, however, you’ll have to carry it in your backpack, and that charger is several pounds, not to mention the space it takes up. 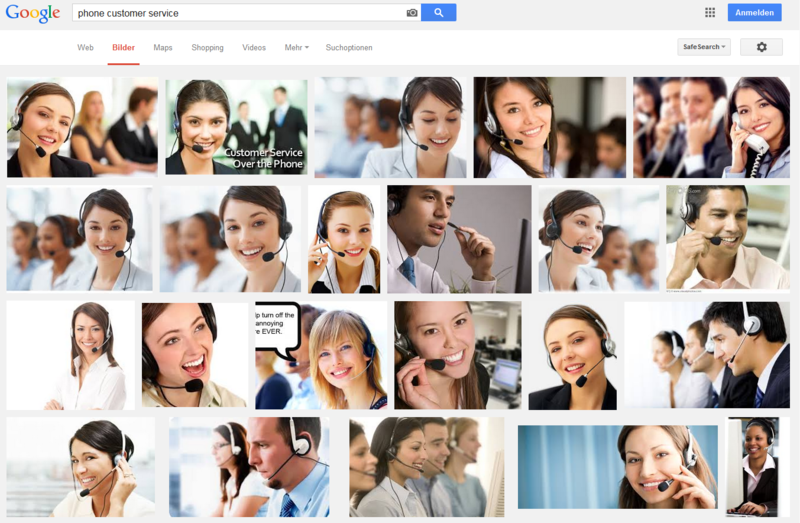 granted… it could be worse. One could argue that the problem is partially solved by taking along a passenger to carry your backpack and therefore, by proxy, the ICCB, but that’s kind of besides the point. We think you could combine the slow charge unit with the 3kW rapid charger already installed in the bike frame, and reduce your needs to an extension cord. At the risk of being a bit mundane, you could even imagine a setup with a rolled up cord, like a vacuum cleaner. 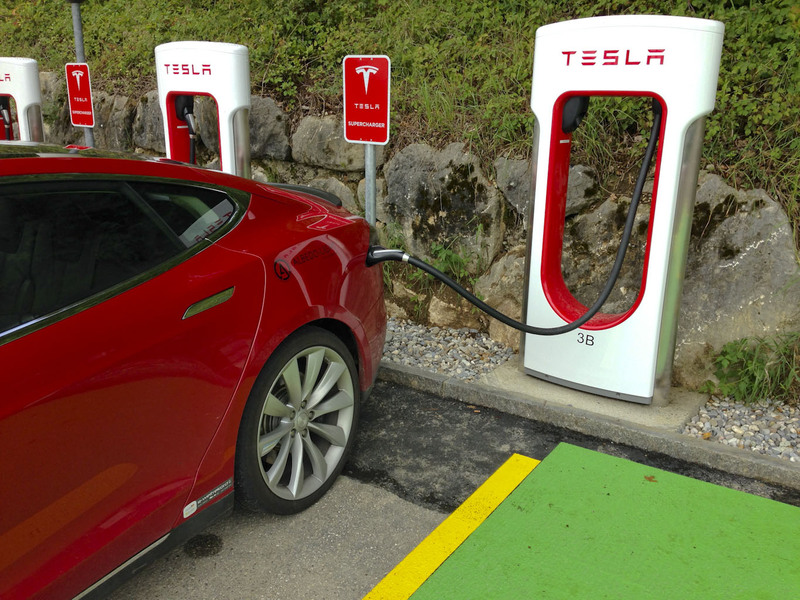 In any event, these are problems we currently face at the dawn of the electric age; hopefully, issues like that will be sorted out in a few years when more versatile charging points might be more common – and/or the plug type discussion has settled a bit. But back to the point… After our test drive, David concluded that the Brammo is a good start but still needs a few major improvements; he’ll stick to the KTM for now. But we’ll certainly come back to test drive the 2015 model. The net result at this point was that we had an hour of great fun but I was stranded with an empty battery…. again…. And there were no fast charge stations available anywhere near. Well, what now? LEMnet to the rescue, we picked a restaurant within range that claimed to have a charge point. When we arrived, indeed, we found a wall box and plugged the Leaf in. 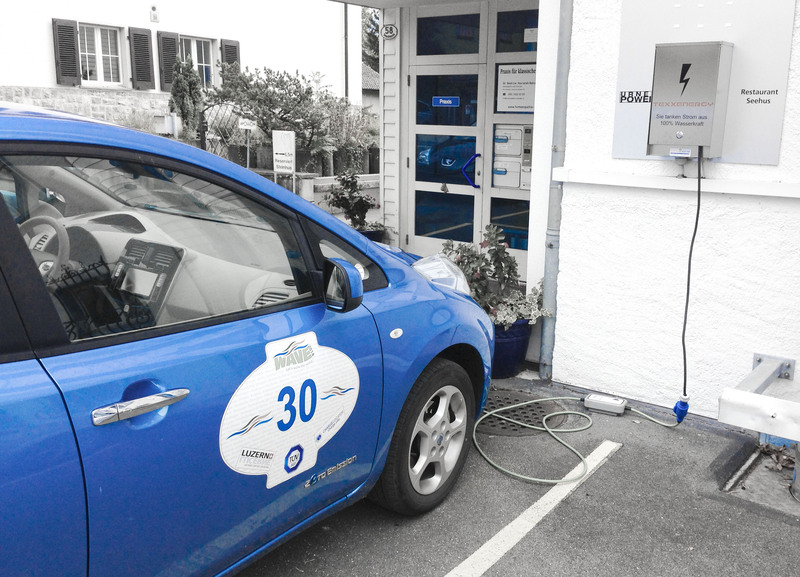 At ten amps, we had all the time in the world to have lunch and coffee – slow charge definitely is one of the few major drawbacks we currently still face in the electric world. In any event, the food was great, and we also learned how to label restrooms the italian way. 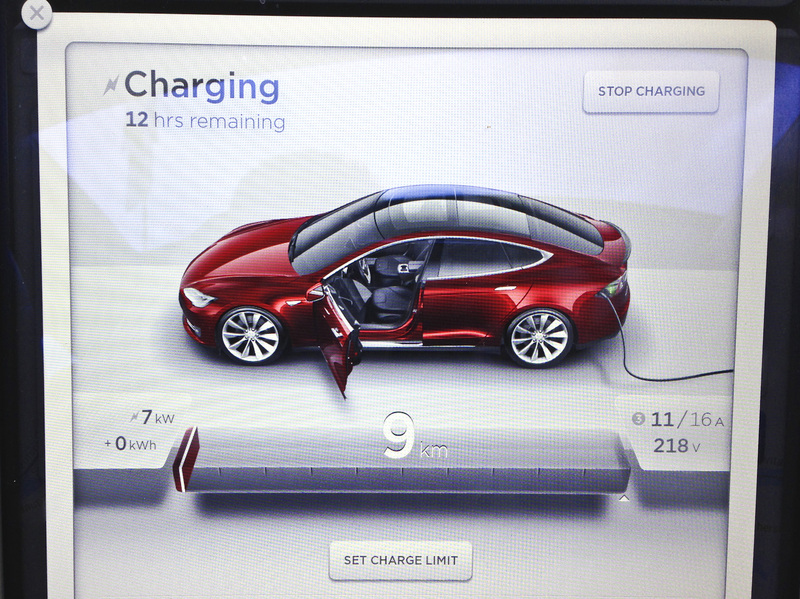 I mentioned slow charge – as you’ve already guessed, even though we took our time, range still wasn’t enough to get home. 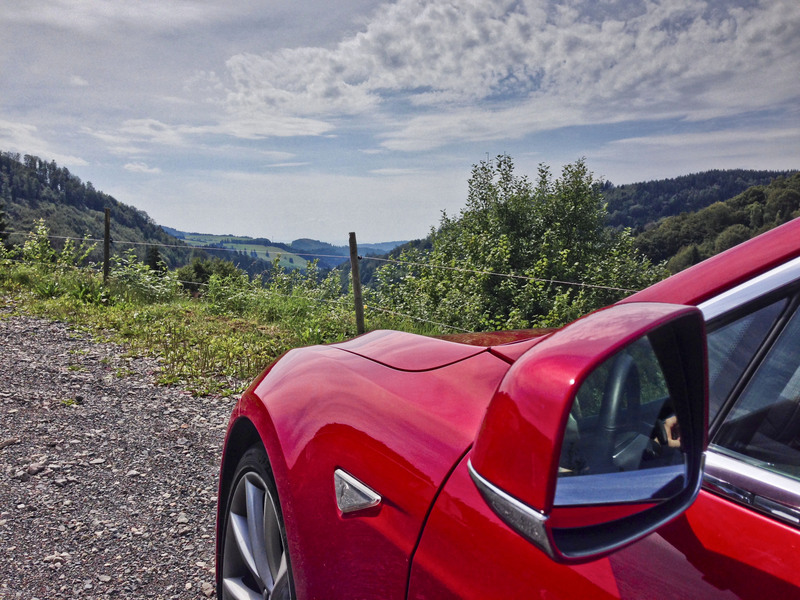 I picked the Tesla Supercharger in Egerkingen (it also has a ChaDeMo charger available, and, as opposed to most other charging points, a restaurant and coffee shop nearby), entered it into the sat nav and we took off. Soon, a friendly lady who, apparently, lives inside the dash of our Nissan, pointed out that the charger might actually be a tad out of reach. 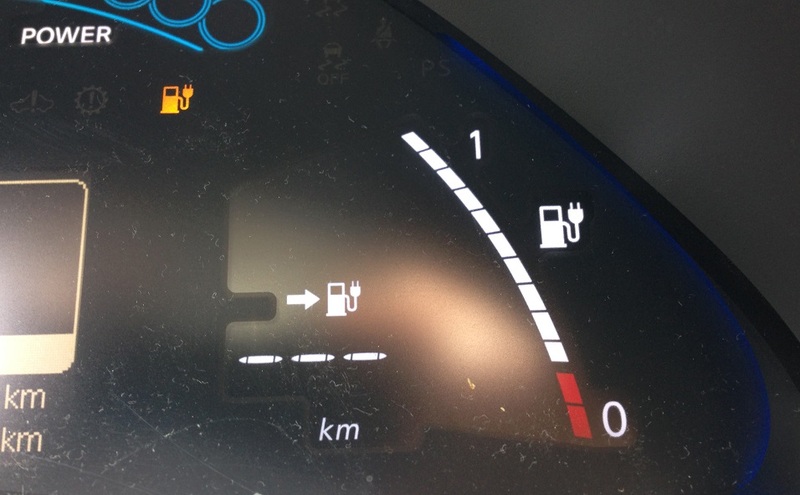 Well, thanks to the fact that we live in an area where ChaDeMo chargers are quite common, another one was found in a jiff and I managed to get there without trouble and 10km still on the clock – no coffee, but I got to keep going in return. And so, after another bit of quick charging, I made it home. Disclaimer: we use a camera support, a remote control and/or the assistance of a passenger to shoot pictures and videos out of a moving car, and we make sure the driver always has both hands on the wheel. We always follow speed limits and traffic laws. We do not take any chances , and neither should you. Picture credits: the bear was photographed by Pat McKillen – for more great wildlife pictures see the full website; the bikers were featured in a Mirror article; Test Drive animated Gif found in the C64 Wikipedia; Charlie Chaplin was in a DVD review by Texas Public Radio; we found the goose ride in the DPC photo gallery, while the Moto-Crotte picture is featured on the hungarian Urbanista blog. Happy clicking! Have you ever been in a situation where you’re talking about food, and a great restaurant comes to mind and you decide to go there? Well, that’s what happened to us. 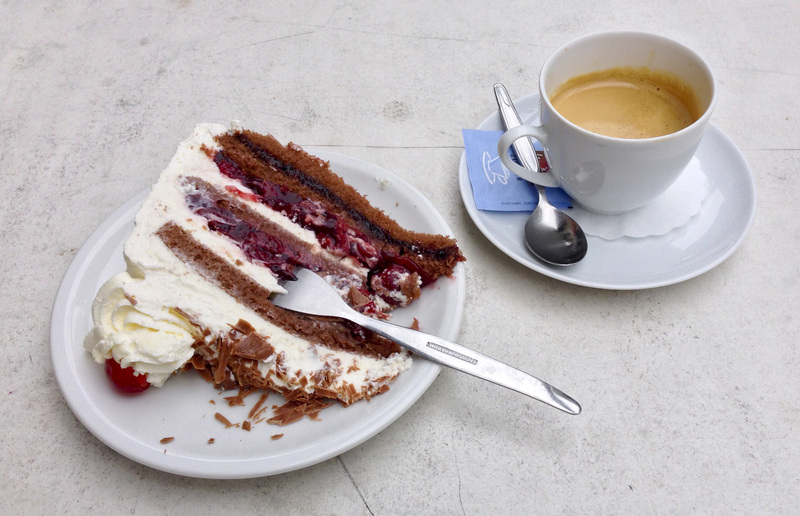 We were casually discussing desserts and I was pondering how I hadn’t had a good Black Forest cake in a while. David said “there’s that place near Titisee, they make the best I’ve ever had”, and you can all guess where this is going. Is this a good excuse for a day out or what? Naturally, we decided to hop into our car and go there. But unfortunately, someone had borrowed the Leaf for the weekend, so we had to do with what we had gotten in return, which was a Tesla Model S P85+. Well, what can you do. As you can see, we had an early start on a foggy Sunday morning, since we wanted to take full advantage of what was of course a test drive weekend in Karl’s P85+. If you participated in, or followed the WAVE, you might recognize the car as being Team Lightning Rod‘s ride. Karl actually light-heartedly handed over the keys, having complete trust that we wouldn’t go wild, and would bring back the car in one piece. …if you get my “drift”. 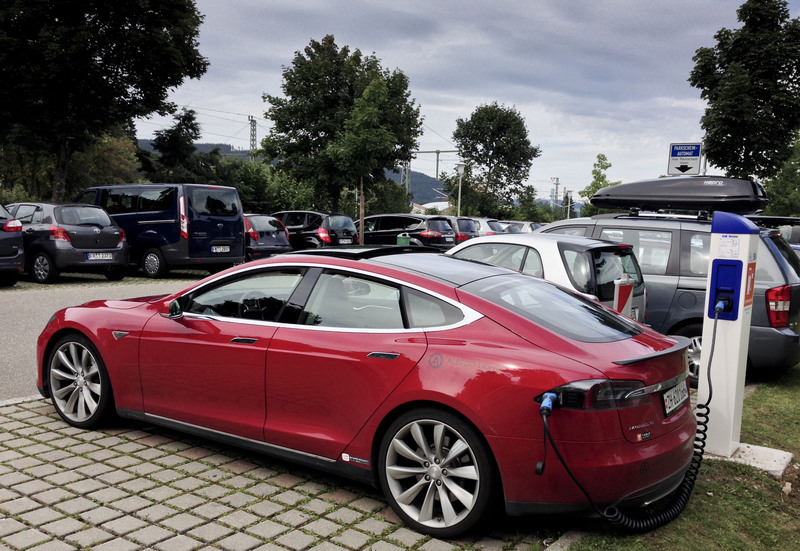 Our first stop was the brand new Tesla Supercharger in Egerkingen; the battery wasn’t full since David had already taken the car for a substantial spin the day before. Incidentally, this also meant that I’d be the one behind the wheel for most of the day (insert evil grin here). Since we were not only looking for fun, but also had in mind to provide you with a halfway decent review of the car, this would be our first “test”. (Note that since there must be a kazillion reviews out there already on the interwebs, we’re not going to do the classic “exterior, interior, driving experience, price and availability” kind of thing – we’ll just provide you with unstructured random blabbing containing a few facts and lots of misguided opinions, as always. We’ll also assume you know a little bit about the car already). Well, let’s just say nothing about charging is complicated. The first thing I appreciated was the reversing camera feed which appears on the giant display/touch screen on the center console when you put it in reverse. On top of it, it has proximity sensors, so in the end, if you back up into something it’s really your own fault. Then, open the charging port, and plug and play charge. At a charging power of 120kW, our coffee break took longer than what was needed to top off the battery. At last, we were now heading north. 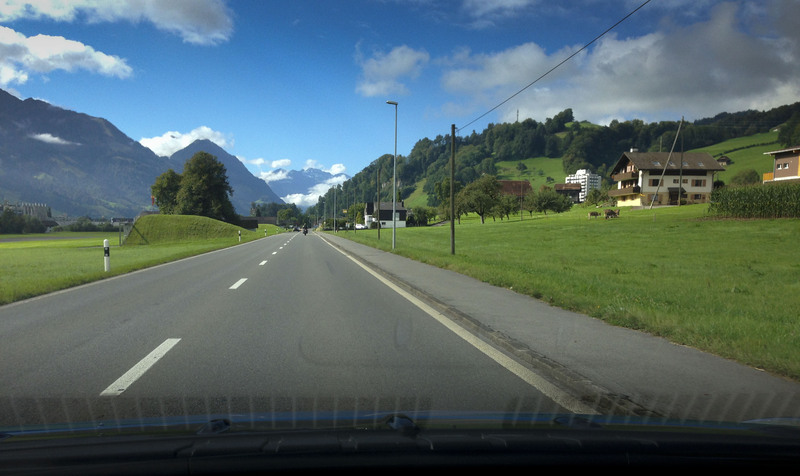 After a quick stop in Basel to give my dad a ride, we crossed the border on the Autobahn… Which meant that we had to come to a full stop at the customs office before accelerating into Germany. Ha! 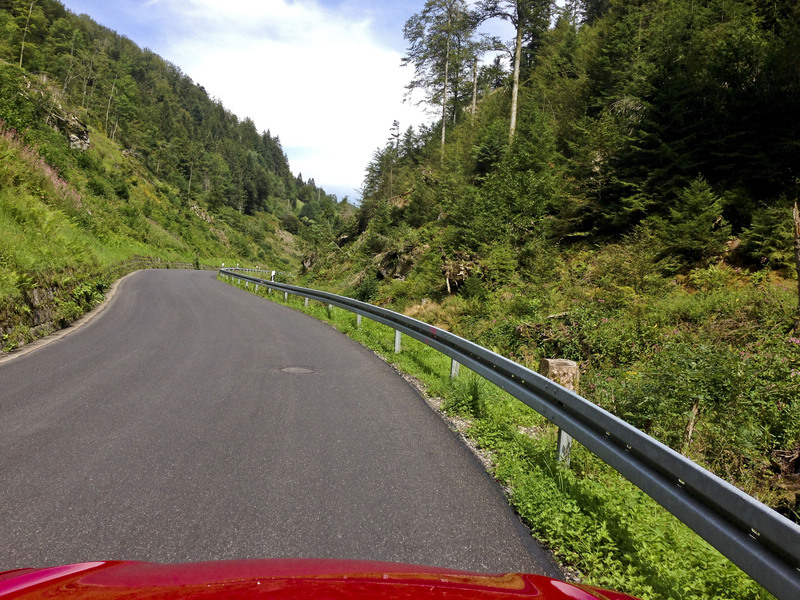 Now I have driven that particular stretch of Autobahn countless times; speed is unlimited there so you can accelerate as much as you want and as far as it goes, which I do pretty much every time. 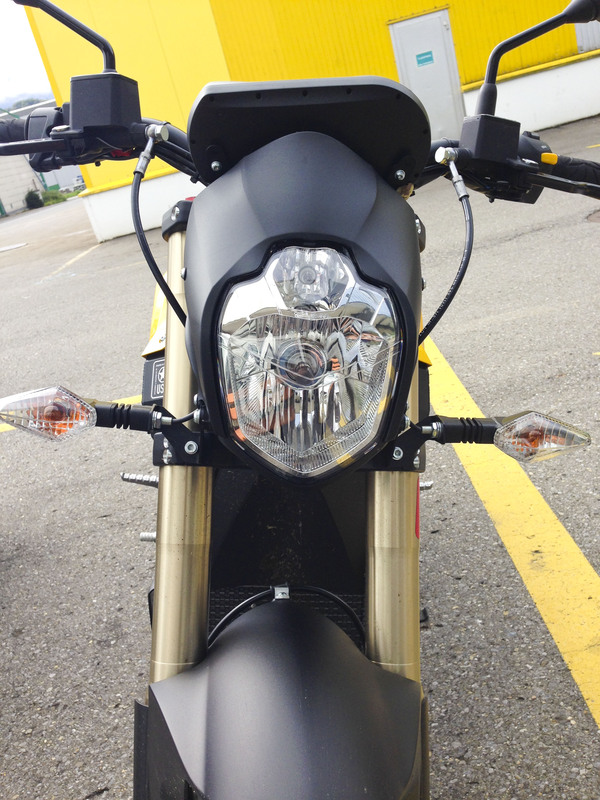 It’s just that I have never hit 200 kph with the customs office still showing in the rearview mirror. The acceleration is just staggering. 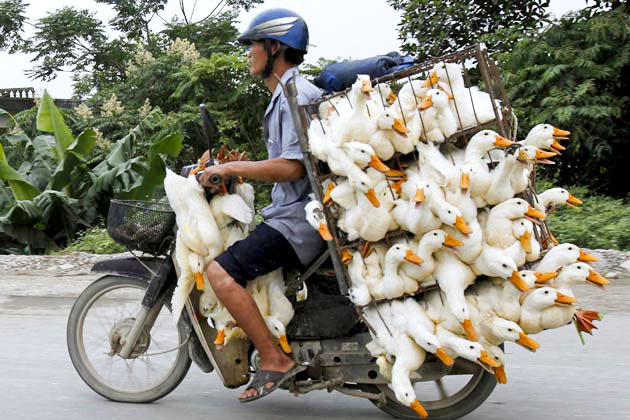 Unfortunately, even though it was Sunday morning, there was a wee bit of traffic, and we couldn’t max out the car. Then again, at some point I was a bit inattentive for a moment and ended up tailgating a Benz. 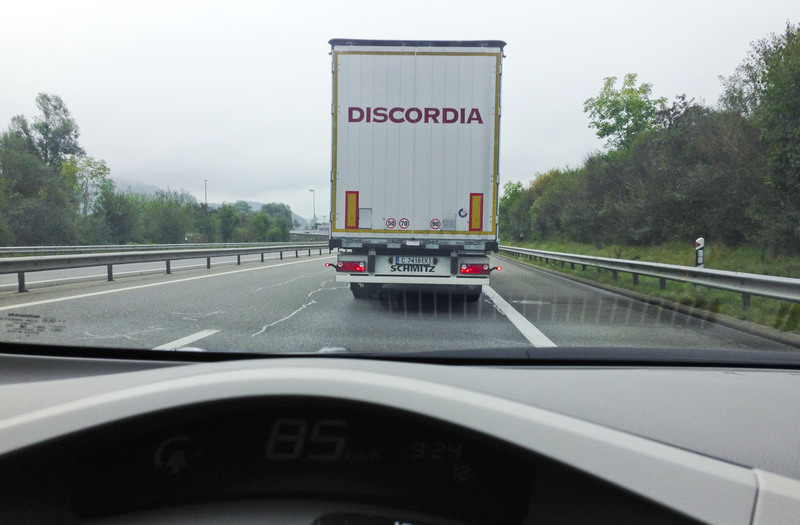 Then I realized, I was tailgating someone while going 200. hm…. In conclusion though, we think the Model S lacks rearview mirror impact; people don’t have the reflex to move over when you pull up from behind. (If you’ve ever had to make up time on the german Autobahn in a Mercedes or BMW, you’ll know what I’m talking about.) And while we’re at it, we’d like to encourage Tesla to make the car more discernable when it gets a facelift. quick: which one’s the Tesla? At the risk of being dismissive, we think its front design looks too much like a Ford Focus… But then again, it also looks a bit like a DB9, so maybe we’re overreacting. I have, however, repeatedly mistaken a Model S for a Jaguar XF, and that needs to change. go ahead and tell me there’s no similarity. 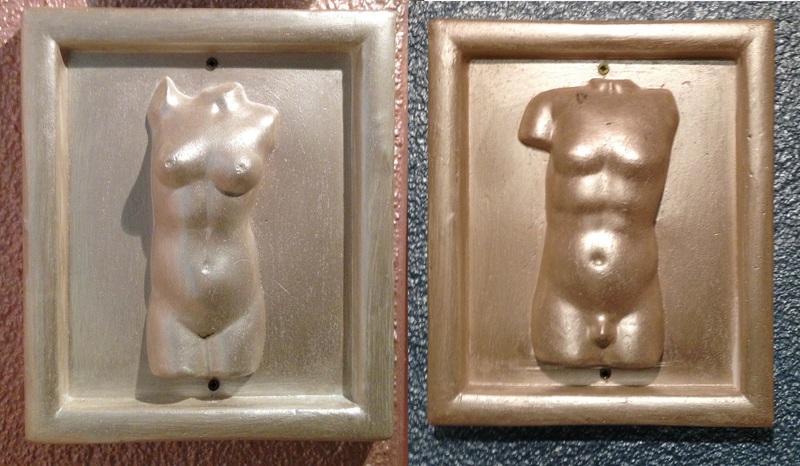 But… aren’t we told that beauty comes from the inside anyway. Moving on… We were now heading for the mountains. We used the map/satellite image display on the center screen and simply chose the most winding roads we could find while heading generally east. 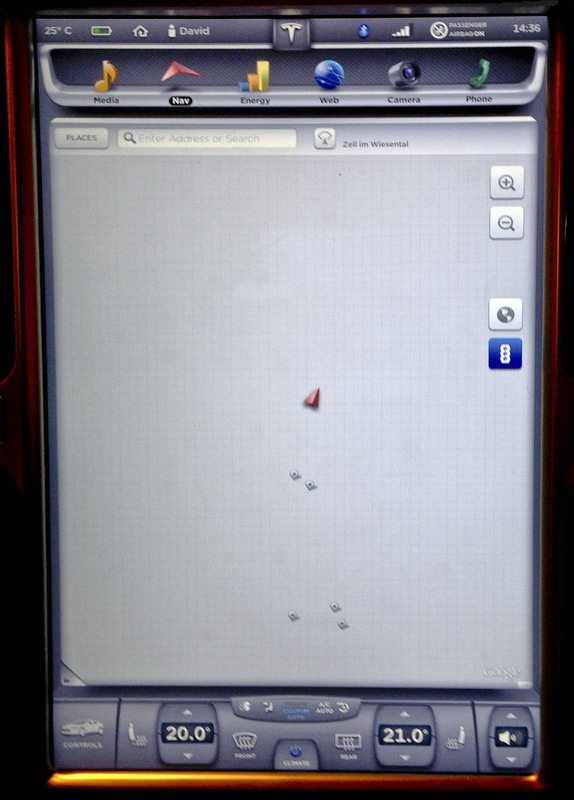 The Model S has a continous connection to the cellphone network and uses Google Maps (what a surprise). 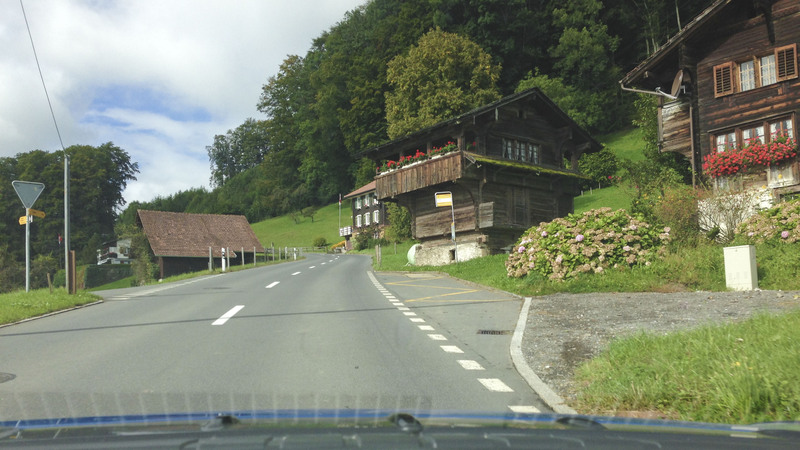 This did not keep us from enjoying the scenery and winding roads. The picture above was taken through the open sliding roof, a feature we also enjoyed otherwise. It is simply huge and it’s great to have it open on a sunny and moderately hot day like we had. 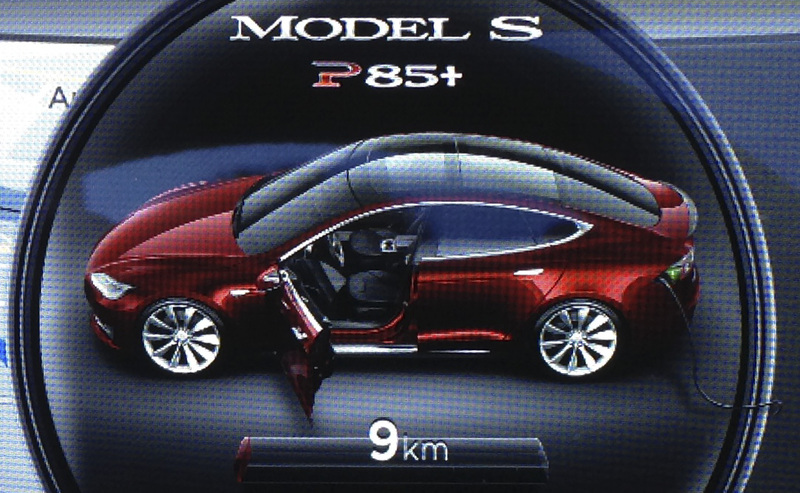 The sliding roof is operated via the center console touch screen – much like everything else on the car. That’s why there are very few buttons otherwise – the hazard flasher switch, the glove box compartment opener and that’s pretty much it. While we’re at it, we’d like to add that we like the simple and modern interior design. 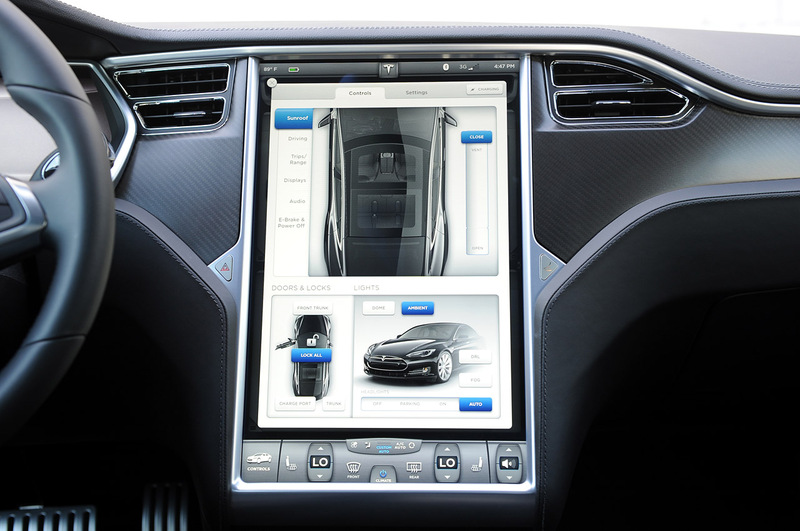 That touch screen is nerd heaven, and the car offers all the luxury you can wish for. The only caveat is that we’ve heard of touch screens go blank, which means you’re royally screwed because you can’t even operate basic things like lighting or the ventilation any more. But this didn’t happen to us – we did however have to reset the sat nav because at some point it refused to zoom in and out of the map properly, and used the Tesla equivalent of Ctrl+Alt+Del to do so. 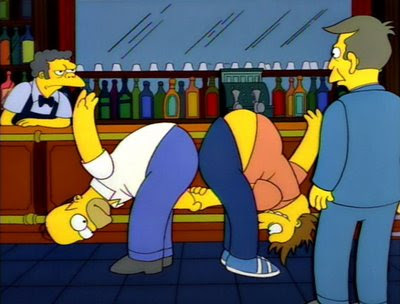 We would in fact like to share with you how that is done but we can’t because it’s one of those secret handshake type of things. There are only a few things we’d like to nag about regarding the interior; for starters, there’s a definite lack of storage trays. Granted, there’s a rolltop tray in the center console, but it’s too small – you can barely fit a cellphone and a set of keys in there. On a side note, that rolltop’s appearance and build quality would fit a Dacia better – call us moaners, but remember we’re talking about a high end luxury car that tops out at six figures here. What else? Well, the front center armrest is a bit weird; it slides back and forth to reveal cupholders. The fact that you bump your elbow into it on a regular basis while driving is slightly irritating – it also means that you’ll be soaking your elbow in hot coffee in every right turn. 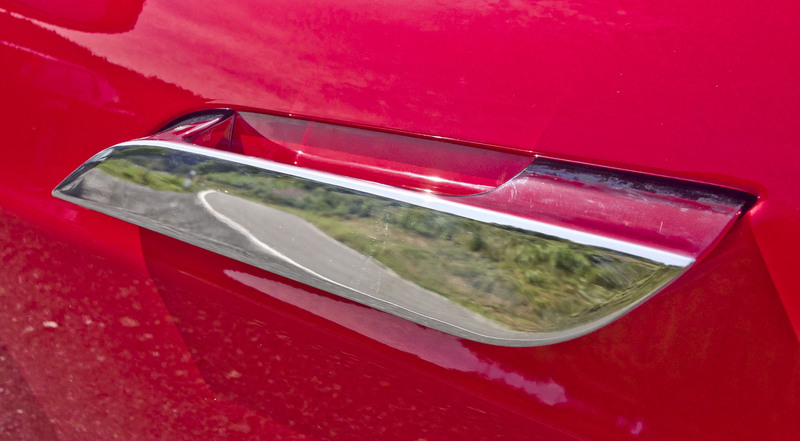 Also, as a passenger, I like to use the roof handle in tight corners to avoid being thrown around – only that the Model S doesn’t have any. So, I kid you not, in right turns I ended up with my window half down and my hand outside on the roof instead. This however doesn’t diminish the fact that overall, we did like the interior very much. As for being the driver, the only thing we didn’t really like is that the cruise control and wiper/turn signal levers are on the same (left) side of the steering wheel and pretty close together. As a result, sometimes you end up setting a cruising speed when you want to signal a turn – which is not really helpful; or you unintentionally spray clean the windshield when you want to reset the cruise control – slightly more helpful, while still unwanted. 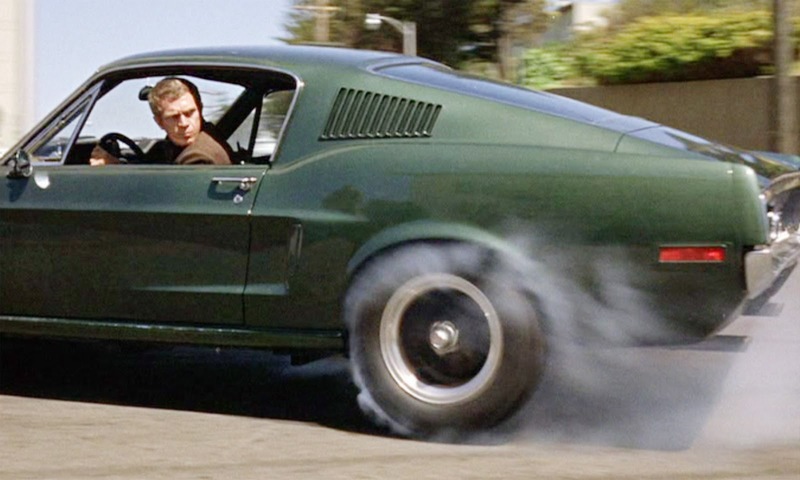 That said, driving that thing is incredible. We’ve already mentioned the acceleration, speed and sheer power it has; it also corners like it’s running on tracks. It’s really impossible to even get the tires to squeal, and only if you blatantly enter a corner too fast and accelerate on top of it will it start to slightly understeer. There is no question that it would be incredibly tail happy if you’d turn off the traction control, a thing we didn’t do. Because… being this is a Model S P85+, the most powerful electric sedan in the world, and will blow your head clean off, you’ve gotta ask yourself a question: “Do I feel lucky?” Well, do ya, punk? As such, with traction contol on, the car is nothing short of foolproof. While driving around, we were also playing with the controls, what a surprise. (We can’t help but keep stressing how cool that touchscreen is BTW). 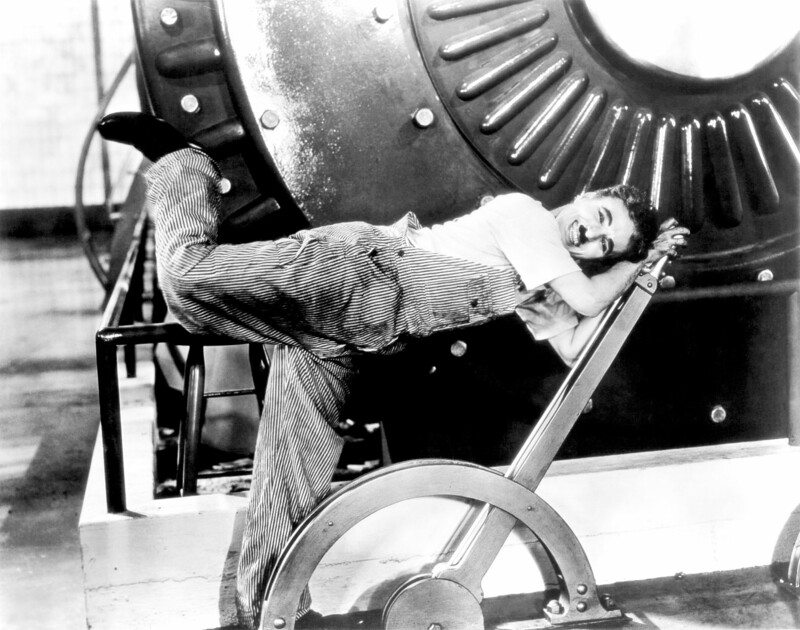 Our car had the optional air suspension, but fiddling with it did not really do much of a difference. 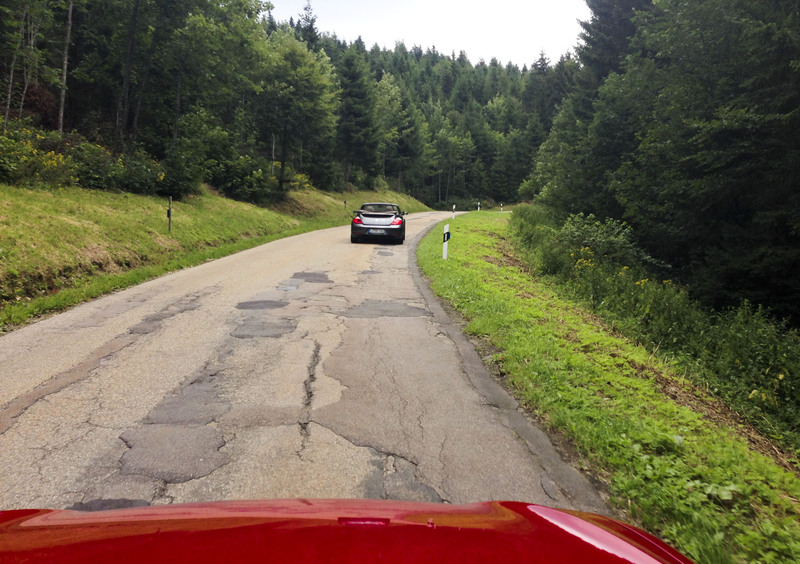 That was, however, before we came onto a stretch of really bad road, as you can see in the next picture. Suddently, High and Low did make a difference like night and day – while the ride would be stiff and hard just like most any other sporty sedan out there, the high setting really ate up most all of those bumps and shakes to make for an enjoyable ride no matter what. Well done. In any event, we were slowly getting to the point where the Wattwurm Effect would set in. 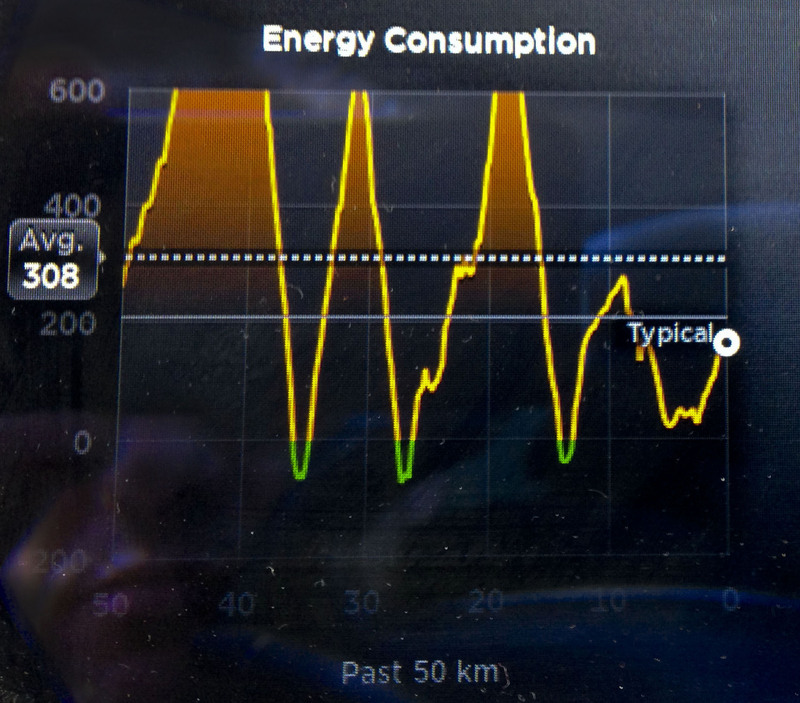 (As some of you will know, this particular effect describes the action of mindlessly racing an electric car up and down the hills until the remaining battery range will be vastly insufficient for the remaining travel distance). We therefore chose a place for lunch in Titisee with a charging station nearby, only to be reminded that a) you always need an RFID card for charging stations in Germany, and b) most power companies have their own, proprietary RFID card. As a result, we had to try and find a card for that particular charging station. Calling the power company didn’t help since the person at the other end didn’t even know they had charging stations for electric cars (which definitely calls for a LOL); their web page indicated that you’re welcome to have your own card, as long as you order it at least one week in advance; and the local tourist office might have had one, but it was closed. Welcome to Germany. if we hadn’t told you, you totally wouldn’t know that we’re not actually charging here. Well, Wattwurm wouldn’t be Wattwurm if something like this would stop us. We simply carried on, finally stopped for that cake that had initiated the whole thing, and started heading home while searching for opportunities to charge. Luckily, even though those opportunities were scarce, we were still up on the hills and as we all know, pretty much everything rolls downhill including Wattwurm, so at least we did get a few extra miles for free and even could regenerate a bit. The entertaining bit about this is that Karl was able to check the car’s position and charge status via his iPhone App, so at some point during the afternoon we started getting slightly concerned texts asking whether we had noticed that we actually would get stranded if we didn’t charge pronto. We tried to yank his chain a bit about it but couldn’t break his cool. The statement we liked most was “I said I want the car back tonight, but tomorrow 8am is fine”. We then located a charging station on a truckstop parking lot that was supposed to be unlocked and went for it. Guess what? Nope. It did in fact require an RFID card to charge; what a surprise. Should I mention that it would have been a different power company, and therefore a different RFID card, with respect to the station in Titisee or did you already come to that conclusion yourself? in retrospect, we also could have taken a shower in the meantime. Since we stayed there for about twenty minutes, we probably ended up stealing no less than 1.5 kWh of power, which corresponds to something like 50 cents. If you’re the parking lot operator and you happen to read this, email me in case you want to sue us. Even though we were now charging with three phases, this wasn’t going anywhere soon. This is, by the way, the only real drawback we think this car has. The battery capacity is huge, so range anxiety is pretty much non-existent, but if you happen to be low and don’t have a high power outlet available, charging takes literally forever. But we’re merely making a point here; there is no question that the battery range on the Model S is fantastic, and unless you’re Wattwurm, simple arithmetic will help you avoid ever getting stranded. 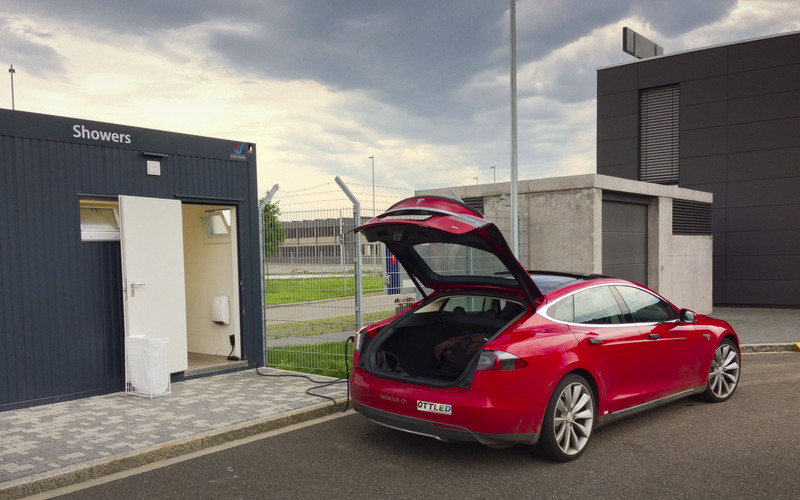 So I guess you know where this is going: Adding yet another couple miles to make it to the next outlet at my home; after charging there again, David left to return the car and stopped at the 20kW AMAG charging station in Schinznach-Bad (which, as usual, acted up…). In the end he managed to add enough to get the car back to Karl’s home. The best part about it is that Tesla’s customer service literally phoned Karl to ask him if he was in trouble. Their system had logged several short-timed low-power attempts to charge and the fact we were driving on a completely empty battery. Incidentally, Team Wattwurm would like to credit Louis Palmer and his Wave Trophy for completely curing us from range anxiety! Now… what’s left to say? let’s see. 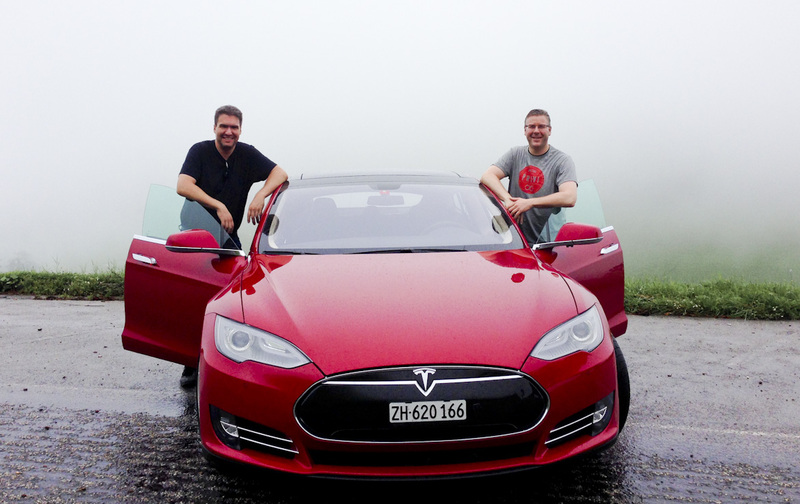 Did we like the Model S? I guess you know by now that we’d both buy one in a heartbeat. 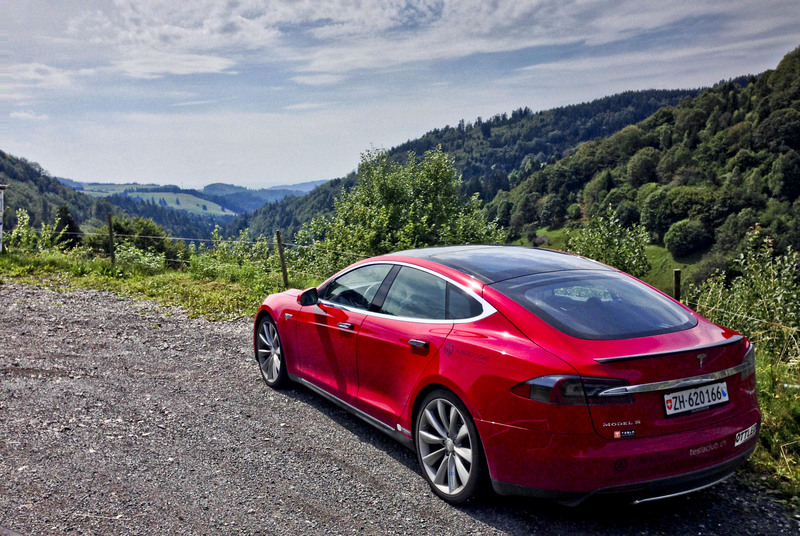 Unless you want to drag a caravan halfway across Europe – without even stopping to take a whiz – or are otherwise running on a tight schedule, we are having a hard time thinking of an everyday situation where a Model S would not be appropriate; even more so once the Supercharger network has been expanded even more, as you undoubtedly know. This car is roomy, it’s comfortable, handling is excellent, acceleration is staggering, and while we have been bitching about a few things, let’s not forget that after all, it’s the first attempt of a brand new car company to design and build a car from scratch (because, remember that the Tesla Roadster, while being a drop dead hot car, is nothing but the love child of a Lotus Elise and a Hewlett-Packard laptop). If we’d really have to nag about something, besides the points named above (mostly the concept and build quality of parts of the interior and a wish for a slightly more distinctive exterior design), it’s difficult to criticize the car much further. A few more electronic helpers, both in terms of safety and comfort, will probably be necessary to attract more customers away from the S-Class; alternately, we could totally see the car remaining just the way it is and coming down price wise instead (because we’d like that very much. I’m not sure if it’ll be breaking news to you that neither David nor I can afford one at this point…). At this point we’d like to extend our gratitude to Karl for letting us have so much fun putting mileage on his car. If you want to help him pay for the rubber we left on those german roads, why don’t you buy a few LED lamps from him. Hopefully we’ve been able to give you and idea about what we think of the Model S. Comment if you have questions, we’ll do our best to confuse you a bit further.